Steve Cameron: Science Fiction & Fantasy Author: Vale: Robin Williams. I woke to learn Robin Williams was gone. I was a huge fan of Happy Days when I was a kid. We all were. I can recall the episode with Robin Williams. 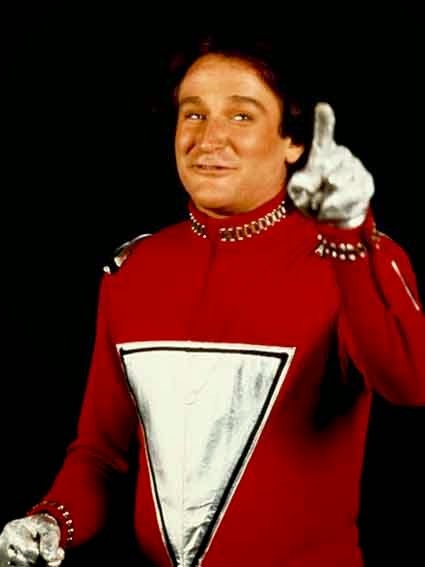 He made an appearance as Mork, the first time I'd even heard of him, which later was the basis of the TV show, Mork & Mindy. That was a great show, at the time. I tried to watch some last year, and it was enjoyable enough in a nostalgic way. But that era hasn't aged very well and neither has the show. It was widely reported at the time that Williams ad-libbed much of the script, and I seem to recall hearing that the scripts often had 'Robin say something funny here' in place for many of Mork's lines. In the mid 80s I watched Robin Williams Live At The Met, a film of his stand up routine. It truly was funny. I remember being in tears with laughter. And this one has aged well. Later I saw Good Morning Vietnam which I had to watch several time because I missed so many of his lines the first time, both from the speed they were delivered and from my own laughter. And then there was more comedy, but some great dramatic roles too. The Fisher King, Dead Poets Society and Good Will Hunting are a few that leap to mind. I didn't love everything he did, particularly later in his career, but if I saw a teaser that he was being interviewed on a TV program I made an effort to watch, simply because you never knew where he was going to take it. My wife literally bumped into him many years ago in San Francisco. Another family member once had dinner with him. They say he was as charming as the twinkle in his eye suggested. So Where Does Luck Come Into It? Coming To You From Another Dimension. Overheard On A Plane No. 2.